Troglitazone was the first thiazolidinedione antidiabetic agent approved for clinical use in 1997, but it was withdrawn from the market in 2000 due to serious idiosyncratic hepatotoxicity. Troglitazone contains the structure of a unique chroman ring of vitamin E, and this structure has the potential to undergo metabolic biotransformation to form quinone metabolites, phenoxy radical intermediate, and epoxide species. Although troglitazone has been shown to induce apoptosis in various hepatic and nonhepatic cells, the involvement of reactive metabolites in the troglitazone cytotoxicity is controversial. Numerous toxicological tests, both in vivo and in vitro, have been used to try to predict the toxicity, but no direct mechanism has been demonstrated that can explain the hapatotoxicity that occurred in some individuals. 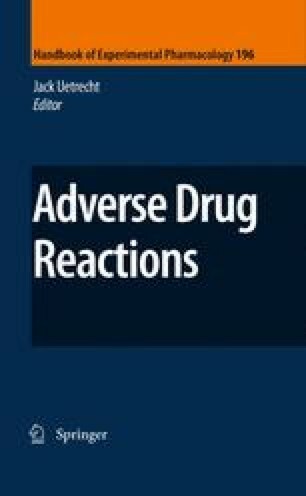 This chapter summarizes the proposed mechanisms of troglitazone hepatotoxicity based in vivo and in vitro studies. Many factors have been proposed to contribute to the mechanism underlying this idiosyncratic toxicity. We thank Mr. Brent Bell for reviewing the manuscript.